So much of what we create in the kitchen comes from some sort of inspiration... our own imagination, something that has captivated our thoughts (or palate)... a recipe we've spied, a photograph, an outing, a conversation. Or, simply an ingredient that's at the peak of its season. In this particular instance, it was much of the above; elements that came together to create a truly flavorful, summer-centric salad composed of so much of the bounty we assign to this time of year: ripe, succulent heirloom tomatoes that range from large, bulbous spheres to smaller varieties of varying symmetry, size and hue; sweet, juicy, summer melon; and crunchy pops of flavor that tie these two seemingly unmatched fruits together... arugula, radish, cucumber, and mint. Oh... and a chili-infused dressing. And, yes, it all (surprisingly) works. The inspiration for this salad was a meal we had at Redd Wood in Yountville, California, just down the street from chef Richard Reddington's well-known spot... Redd. This newer venture, however, is a more casual, rustic restaurant... a chic pizza spot that is so much more than pies (though the pies are delicious!). We have a favorite place we stay at in Yountville... a perfect locale for not just enjoying the fruit of this region's nectar, but a truly central position to many wonderful restaurants. And Redd Wood is just a good stroll from this perch, making it not only a great choice for good food but convenient! For us, it was a great spot to enjoy a relaxed, late evening meal tacked onto an equally relaxed, perfect day spent in and amongst the vineyards of this region. This is my own rendition of the salad we selected at Redd Wood. 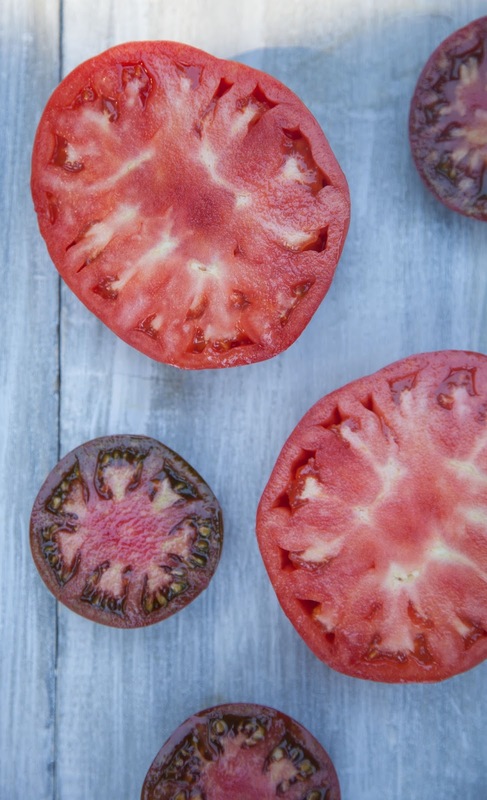 As said, it incorporates a lot of what summer has to offer and, in particular, two ingredients you might not think to couple: heirloom tomatoes and cantaloupe. Then it pops these two ingredients with the addition of radish and arugula... flavors that kind of turn the lights on in this salad. And, unexpectedly, dresses it all in a light, chili-infused vinaigrette which illuminates the flavor of this salad but also keeps it so approachable. In my version, I use a jalapeño pepper and tempered its robust flavor with a bit of honey, fresh orange juice and a little cayenne pepper. It's kind of summer at its best... bountiful, bold... and balanced. The key to this salad's success (like any really) is getting the best ingredients... perfectly ripe tomatoes and melon are a must. 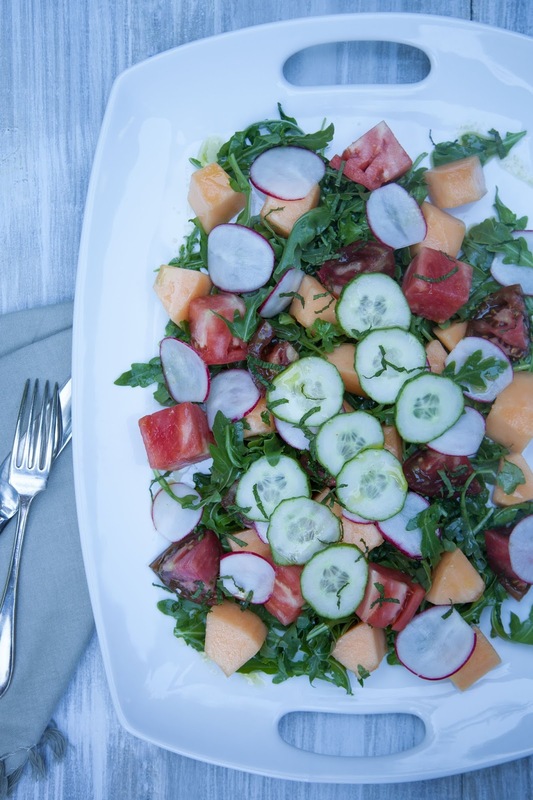 And, keeping these fruits chunky (good-sized bites) is particularly appealing nestled against the arugula and sprinkled with whisper-thin slices of cucumber and radish (courtesy of a mandolin slicer!). And, as a pretty and essential flavor finish, a light dusting of mint. (Once you compose your salads, you may have a few ingredients left over (depending on how much or little you choose to use). Blend jalapeño pepper(s) and orange juice on high for approximately 1 to 2 minutes, until completely emulsified. Then pour mixture through strainer into a bowl and discard extracted pulp. Add honey, cayenne, salt and olive oil to pepper-orange juice emulsion and whisk until thoroughly combined. Season with additional salt, to taste. Set aside. Place arugula in a large bowl and drizzle with about 1 to 2 tablespoons of vinaigrette, to just lightly dress greens. Toss to coat. 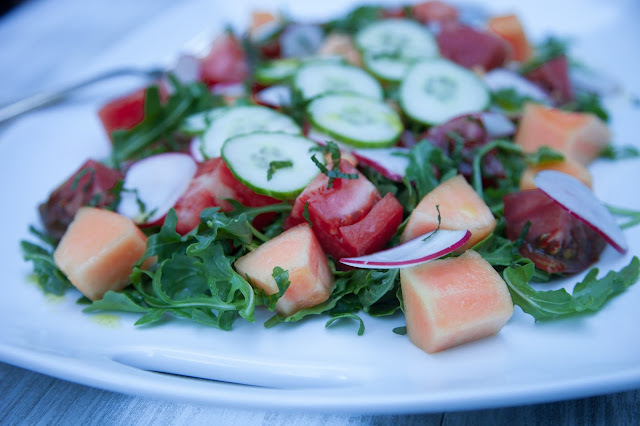 Then arrange arugula on a large platter or on individual plates and dot with chunks of tomato and melon. Sprinkle cucumber and radish atop salad fixings and add a light fleck of mint to finish. Then drizzle the whole plating with just a touch of additional vinaigrette, to taste.